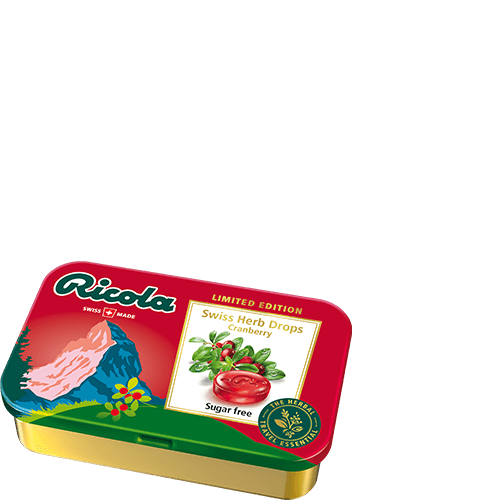 Sweetener (isomalt), cranberry juice concentrate (0,6 %), extract (0,5 %) of Ricola’s herb mixture, black chokeberry concentrate, sweeteners (aspartame, acesulfame-K), natural cranberry flavouring with other natural flavourings, menthol, natural flavourings. Nutrition information per 100 g: Energy 990 kJ / 235 kcal; fat 0 g, of which saturates 0 g; carbohydrate 97 g, of which sugars 0 g, polyols 97 g; protein 0 g; salt 0 g.
Sweetener (isomalt), acid (citric acid), extract (0.3 %) of lemon balm and Ricola’s herb mixture, natural citrus flavouring, sweeteners (sucralose, acesulfame-K), natural mint flavouring, menthol, colour (beta carotene). Nutrition information per 100 g: Energy 990 kJ / 235 kcal; fat 0 g, of which saturates 0 g; carbohydrate 96 g, of which sugars 0 g, polyols 96 g; protein 0 g; salt 0 g.
natural flavourings, menthol, natural flavourings. Nutrition information per 100 g: Energy 990 kJ / 235 kcal; fat 0 g, of which saturates 0 g; carbohydrate 97 g, of which sugars 0 g, polyols 96 g; protein 0 g; salt 0 g.
The Ricola tin with limited-edition Swiss design is the perfect travel companion. Your throat and voice are often put under strain when traveling. 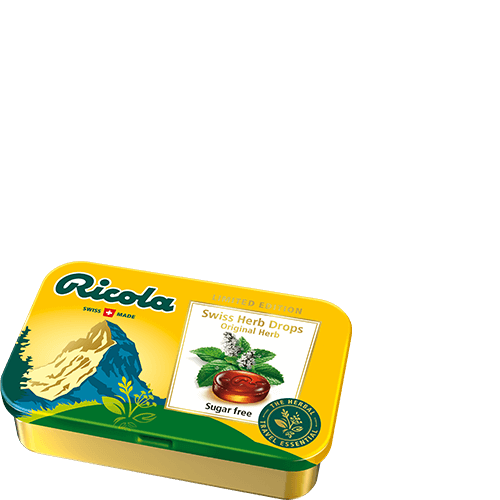 Luckily, you can now get soothing Ricola herb drops in a handy tin. Whether it’s a souvenir or a gift, there’s room for this small, premium tin in any bag. Available in Original Herb, Lemon Mint and Cranberry flavors. The tin is part of Ricola’s Herbal Travel Essentials range, available exclusively in duty-free shops. Made from a secret recipe since 1940.